"Gilligan's Island" as a big-screen movie? 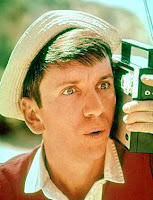 As much as I hate the idea, I agree with ol' Sherwood Schwartz -- Michael Cera would be perfect as Gilligan. I also created an msnbc.com poll on whether there are just too many Hollywood remakes of old shows. You can imagine where I stand on this. Who's going to play the Big Ragu? Funky Food Friday: Tato Skins! Jezebel tackles Get in Shape, Girl! Copyboys, pinsetters and more, oh boy! Classic Clip Monday: I'm the sole survivor!